We have heard of pasteurized milk, but have we ever heard of pasteurized honey? What is pasteurized? Pasteurization is a heating process to food or beverages at a certain temperature in order to kill microorganisms contained in food or drink. Pasteurization is inventor Louis Pasteur, a French scientist, who completed his first pasteurization test in 1862. In pasteurization, not all microorganisms were killed, as in the sterilization process, but reduced in number. In order to maintain quality, once pasteurized foods / drinks should be refrigerated and consumed before the expiration date. HTST (High Temperature Short Time). HTST is a technique that is often used in different countries, the way is to warm the honey temperature approximately 72 degrees Celsius for a minimum of 15 minutes. LTLT (Low Temperature Long Time). It is a warm honey with a lower temperature (approximately 63 degrees Celsius), but with a longer time (30 minutes). (Ultra High Temperature). UHT technique is heating honey with a temperature approximately 135 degrees Celsius with a very short time, which is 1 or 2 seconds. In this process all the microorganisms die. Honey is pasteurized to kill microorganisms in the honey, so there is no gas and froth coming out of honey. Microorganisms in honey participate in the release of gas and froth on honey. If microorganisms in honey is turned off, then the honey will not be out of gas and froth. If life and were the percentage of water content of honey is right. it will continue to produce gas and froth. If the honey is left in the bottle were closed, he had frequently opened, otherwise it can get out the honey with gas when opened, will hit the gas cap that caps jumped out or in some cases, if the bottle is thin, the gas the honey will hit the bottle until the bottle explodes. Microorganisms in honey does not work to produce gas and froth if honey has a moisture content of 17% down. Average moisture content of honey Indonesia has 21% - 28% so that the average of all the honey Indonesia issued a froth and gas. The number of bubbles and gas depends on the water content in honey. Honey with high water content has a lot of froth and gas, while the honey with a lower water content have less froth and gas. Honey with a moisture content of 17% down and the gas does not emit bubbles at all. Pasteurized honey with deadly aim microorganisms in honey. When microorganisms die, no gas, no longer bubbles that continuously come out, and honey can be stored and taken anywhere without fear of exploding or pop. It is more influential in the packing process and is usually done by a factory producing honey in bulk packaging. Based on research, almost 80% are foreign disupermarket honey pasteurized honey, we do not know that in Indonesia. Factory pasteurise honey in order to minimize losses and maximize profits. If he had to put all the products in all the minimarket, supermarket, malls, markets, shops danapotik, he must take into account how much harm would be obtained if the honey burst or explode and open the bottle cap. One way is to pasteurise honey. With pasteurization, honey can be stored for long periods and were taken without fear of explosion or burst and gas arise. If the manufacturer gives honey to the high water content of the breeder, honey also will appear lumpy after undergoing a process of pasteurization. Conceivably, if there is a factory that produces honey on a national scale, where 1 of 1 dozen honey burst, what is the loss? Pasteursiasi dlakukan is the usual process by the manufacturer to package honey. 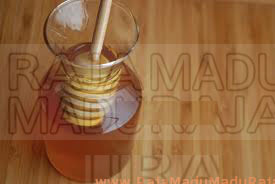 Is the type of honey from the Raja Madu Madu Raja Bee Farm? Raja Madu Madu Raja Bee Farm provides raw honey, or unpasteurized honey. We provide natural honey without the pasteurization process. All the honey we harvested, filtered and fed directly into the bottle without going through any process. Are the side effects of pasteurization on honey? Side effects of pasteurized honey is dead variety of useful enzymes in the honey. Pasteurized honey has nutrients and vitamins are very few or even none. How do I know if I bought honey pasteurized honey or not? How to find the honey that I bought have gone through the pasteurization process or not is to examine the content of HMF in honey in the lab. This test is inexpensive and can be used as indicators of honey has undergone pasteurization process or not. Referring to the standard ISO 2004 on honey, honey SNI should have less than 50 mg per Kg. The lower HMF owned honey, the better honey. If honey has HMF above 50 mg per kg, there is the possibility of honey has been undergoing a process of pasteurization.